These striped adult bloomers are perfect for your cosplay needs. 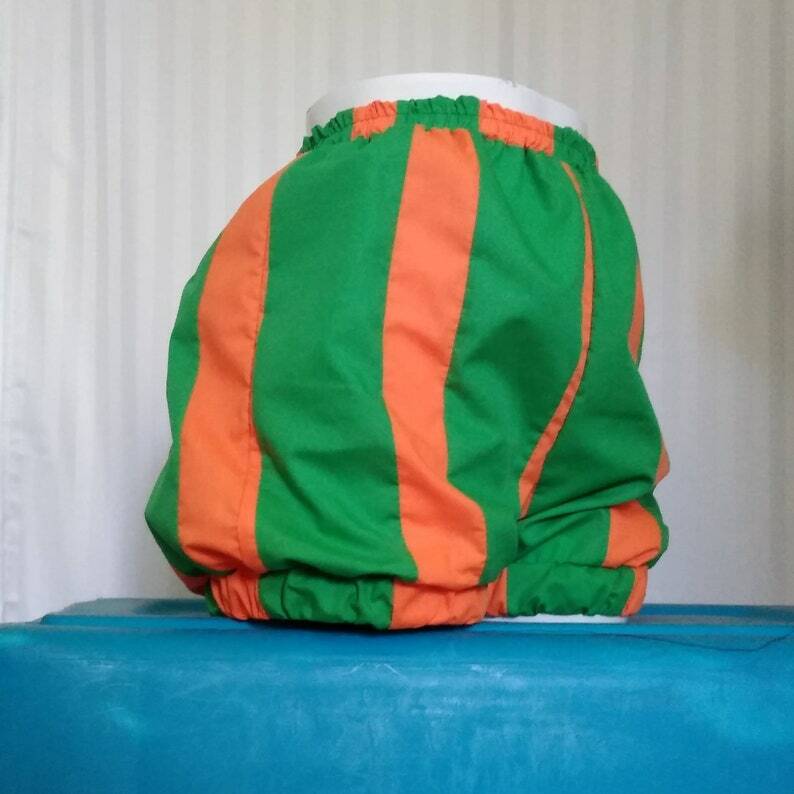 All of our bloomers feature an elastic waistband and elastic leg openings for a super comfortable fit. If you would the garment to be longer, it is $8 for each additional 2 inches for printed fabrics, and 4 inches for solid color fabric. Please add this fee to your cart before you checkout. We use professional sewing and overlock machines to ensure the longevity of each garment. Machine wash cold and line dry or low heat setting on the dryer for best results unless otherwise stated. Our size chart can be found as the last photo in each listing. If your measurements differ from those found on the size chart, simply provide your bust, waist, and hip measurements at checkout. For bloomers, if your waist and hip measurements fall in two different sizes, choose the size that best fits your hip measurement and we will adjust the waist to the measurement you provide at checkout. We take custom requests on a case by case basis. There are three options for rush production, which can all be selected at checkout. Please select the best option that works with your deadline and be sure to list that deadline in a note at checkout. This does not include shipping time. Message us for a quote if rush shipping is also required. I absolutely love these! Shipping was super fast, they fit me perfectly, and the material is good quality. I highly recommend! Exactly as described, great fit and fast turnaround. Perfect for my daughters cosplay, she loves them! Thank you! Once it was shipped it arrived very quickly. They're the perfect size and they look great! They're perfect for my Ms. Joke cosplay! All prices are correct at the time of entering the relevant information. We reserve the right to change prices without prior notice, but this will not affect any confirmed orders. Once you place an order and production has already started, you cannot cancel your order. Exchanges can be made, however. Returns on made-to-order items will not be accepted. We guarantee that the garments we make for you will fit the measurements with which we were provided, or we will alter or replace them free of charge. If, however, if alterations or replacements are necessary because we were given inaccurate measurements, there will be an additional charge for a replacement or alteration. Return shipping charges are non-refundable and are the full responsibility of the customer. We ship internationally. Flat-rate shipping applies to the US and Canada. Shipping cost is calculated based on the amount of items purchased. All US orders come with tracking and delivery confirmation for complete proof of delivery. We are not responsible for the customs, duty or brokerage fees on international orders, please inquire at your local customs to familiarize yourself with the local laws. Please allow 2-5 weeks for production time. If you need your item sooner, please choose a rush production upgrade at checkout. Remember to leave the deadline in a note at checkout to ensure your package arrives in time. Exchanges welcome. No refunds on made-to-order products. Our size chart can be found as the last image in each listing. All measurements are in inches.